IMPORTANT WARNING: This is a partner discount by special invitation only and the price WILL be going up soon! So please read this page now, or you will miss out on the lowest price. Get The Complete Exit Splash Package For Only $67 $47! So Act Fast Before This Page Is Gone Forever! Own Products ... or Your Money Back! Do you like simple solutions? Perhaps my love for simple things stemmed from the complexity of my field of study. So I've developed a passion for taking complicated things and making them SIMPLE. Fortunately for you, I'm just as passionate about Internet marketing as I am about engineering, and I've applied the same "simplicity philosophy" to the marketing tools that I've developed. You'll appreciate this if you've purchased web tools in the past; particularly if you found them to be frustrating. YIKES! Some web tools are more complicated than the electrical diagrams I've worked with! You've probably tried to use some of them, right? And here's the worst part... after all the time and frustration you've invested, most of them still don't put more money in your pocket. So when I set out to build my newest income-generating web tool, I knew I wanted it to be the easiest and simplest thing I've ever created. This is my EASIEST and SIMPLEST product EVER! I'm telling you, I've been marketing online for a long time, and I've tried virtually everything... and this is the quickest and easiest way I've discovered for ANY website owner to make more sales and get more leads, just by adding my little script to their website. There is a HIDDEN INCOME STREAM on your website, and if you're not using this tactic, you're simply throwing it away and letting it go to waste! People are LEAVING your website. That's to be expected, right? They're leaving WITHOUT TAKING ACTION! And that's a problem because it means you're wasting a percentage of your web traffic, and you're not making any money from it. In most cases, the majority of your visitors are leaving without taking any action. Even if you have a "good" converting sales page, you probably have 95 out of 100 visitors leaving your site without taking any action. Sales pages - regardless of what you're selling. E-commerce sites - regardless of what you're selling/promoting. Landing pages - regardless of what kind of landing page it is. Squeeze pages - regardless of your opt-in rate, unless it's 100%. Content sites - regardless of your niche, or method of monetization. On ALL of the above types of websites, you're wasting valuable exit traffic unless you're capturing it with a technique like mine. If you can copy and paste, you can use my script to improve your bottom line by making more sales and getting more subscribers... WITHOUT any additional traffic to your website! When someone tries leaving your site, an unblockable box will pop up and give them a reason to stay on your site. The visitor will click to stay on your site, and they will be directed to an "Exit Splash" page. An Exit Splash page is a special web page that your visitor is taken to as an alternative to leaving your website. As I mentioned before, visitors ARE leaving your website. Regardless of what kind of site you have, it's a simple fact that many people are not going to take the time to read or view the content on your page. You only have a few seconds to capture their attention, and if you don't-- they're gone! Often forever. My Exit Splash program gives you an opportunity to open a new channel of communication with them, to capture their attention, and turn that potentially wasted visitor into a lead or a sale. The initial pop-up is NOT blocked by pop up blockers. It's unblockable. IMPORTANT NOTE: It's actually not a pop-up "window" at all (and that's a good thing)! It' also not a "pop-over" or any other type of browser window. It's a special dialogue box that is built into virtually all browser software. It's a part of the actual Internet protocol. You know those grey boxes that pop-up on your computer if you do something wrong, or if a program encounters an error? THAT'S the kind of box this is. In other words, they CAN'T ignore it, and they HAVE to click it to continue. My script enables you to put YOUR message on that box, and your visitors are FORCED to view it. They must decide whether to stay on your site, or continue to leave... which means it also forces them to TAKE an action!! This simple, but powerful, small action can actually make them more likely to buy from you. It's known that small actions and commitments in the sales process often lead to a bigger action (making a sale). So if you're into the whole "sales psychology" thing, you should recognize that this is a great tool to convert prospects into buyers. Exit Splash Increased The Number of Signups by 325% Resulting in an Extra 2,140 New Leads! By the Way ... Just Those Subscribers in the First Week Made Me An Extra $4,329! "I Made an Extra $2,692 in 1 Week Simply Using My Membership Logout Pages ... AND I Captured 387 Extra Leads to My Lists in 7 Days!" "I Captured an Additional 375 New Subscribers in 4 Days To Join My Live Webinar!" Exit splash is another one of your brilliant creations. Thank you very much for letting me use a beta version of your exit script during my Golden Thread launch. I was able to add 1000's of new leads using this script! 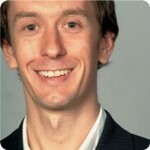 Michael is well known in the Internet marketing community. As a member of my mastermind group, I gave him the opportunity to test my new Exit Splash technology on his recent launch of his Golden Thread program. He reported back that the results were nothing short of stunning, and that he added over 20,000 subscribers while using my script! "Something This Simple Can Make Such A Drastic Difference In Someone's Business Online..."
"Probably the Easiest I Have Every Used!..." "How I Made $1,825 Extra Per Month! ..."
"I started seeing results pretty much after the first 10 hours of adding it on several of my sites ..."
I just wanted to let you know how excited I am about Exit Splash! I have it on several webpages, as well as my blog it's awesome. I started seeing results pretty much after the first 10 hours of adding it on several of my sites so I'm sure you can understand why I'm so excited. This is going to make a Huge Impact for my business this year! I really like the process of the application itself I havn't seen anything that works this way. The other apps included are an added bonus. When people see what they can do with this they'll flip out at the possibilities. What I like the most is that you actually personally contacted me and worked with me, and that really meant alot. I've never experienced personal support in this way. I just wanted to make sure I show you the proper appreciation, so Thank You so much for the personal help as well as a great product! 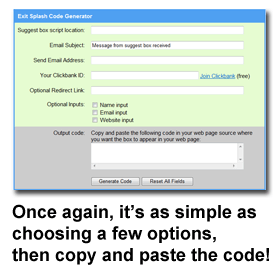 "I Generated 391 Leads in 2 Days ... and Made and Extra $247 From 1 Mailout Using Exit Splash!" "I Installed the Script in Less than 10 Minutes on My WordPress Site and 6 Hours Later I had My First Sale Through the Script That I Would Have Never Gotten ... !" "I Added an Additional 933 People Into My Sales Funnel in 3 Days ..."
Okay, so as you can see from the stories above, you don't have to take MY word for it. "I just couldn't get over how simple it was! ..."
my opt-in rate increased by 42%!" I placed your Exit Splash script on one of my membership sites and the results were amazing! After just one week of having this tiny, but powerful script installed, my opt-in rate increased by 42%! The install was super simple and the videos you provided made everything very easy to understand. Thanks Dave, for providing another awesome tool. "I Captured an Additional 83 New Subscribers using Exit Splash that Were Leaving My Website!" "I Made Nearly a $1000 in Less Than 48 hours!" And remember, this is a brand new program and I only allowed a handful of people to test it (100% of them had good results)... so I'd love to add YOUR success story soon! your visitors better than anything like it! First of all, you flat out will not find a script with all the features of my Exit Splash program for sale ANYWHERE else. I've taken the technology and pushed it to a new level. But you might still be wondering... what truly makes Exit Splash better than anything else similar to it? For one, it's simpler. It's so simple that there is not even an admin area. Nothing to log into and configure. Just a simple script to upload. Small and powerful. You might be wondering how this program compares to my Virtual Smart Agent program. Well, I will say that VSA is extremely powerful. But my Exit Splash program is MUCH easier to use, and so far the results have been just as good and in some cases better than VSA! Again, there's no database, nothing to program, no responses to write, there's not even an admin area to configure. You simply upload it and put it to use! Almost all other scripts take a lot more work to install and implement. One small example would be the fact that with other exit-pop type of scripts you have to manually disable the exit pop on ALL of your order links, opt-in buttons, etc. What a pain! All you have to do is select a few options on my user-friendly code-generator, and then copy and paste your code into your website! If you're familiar with the way these splash message boxes work, you may know that the visitor must click the "cancel" button to remain on your site. Impact alert message. I've added an optional additional "alert" message. This message will pop up FIRST and provide a customizable message to your visitor to instruct them about how to click the next message to stay on your site. This helps ensure that they understand which button to click to make sure they stay instead of leaving, and eliminates the problem of them clicking away without reading your message. Impact image. I've programmed the Exit Splash program to display an optional image above the splash box, along with a customizable background color. I've had good results using what I call a "Helper Image". 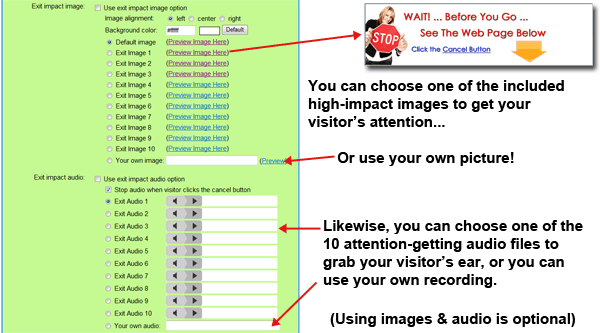 It gives your visitor a visual representation of WHERE to click so they know how to stay on your site. Impact audio. Similarly, you may choose to play an audio message when the splash pop-up appears. The audio instructs them what to do. In other words, it tells them how to stay on the site so they can get a discount, a free gift, or whatever your Exit Splash page is offering. Some people tend to not read things very well, so if you've got someone talking to them while they read it, it will greatly increase your chance of getting their attention and directing them to take the desired action. By using these HIGH IMPACT features found nowhere else, you can virtually reach out and GRAB your exiting visitors and cause them to have an instant change of heart! I should also mention that you can use your copy of Exit Splash it on ALL of your sites. You may install it on UNLIMITED sites/pages that you personally own. So now that I've told you about a few of the reasons why Exit Splash is the best of its kind, let's talk about the Exit Splash pages themselves, and how they will boost your business. 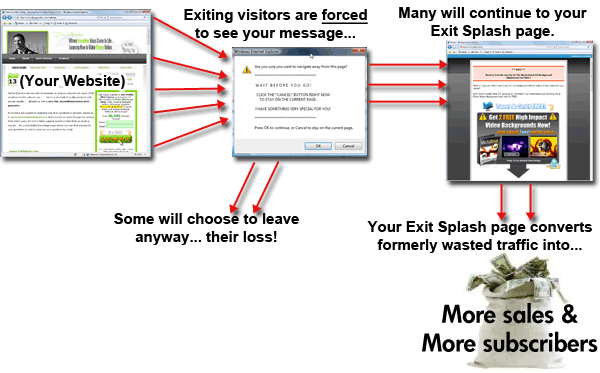 You can use Exit Splash to show ANYTHING to your visitors... from discount offers to squeeze pages to exit polls -- you could even send them to an affiliate link! As I explained above, your Exit Splash page is where your visitors are sent after the pop-up box intervenes and convinces them to stay on your site. Technically, you can send them to ANY web address, which means you have complete flexibility and an unlimited number of possibilities at your fingertips. On a sales page... When the box pops up, you can display a message telling your exiting visitors about a special discount. All they need to do is click the button and they will be taken to your Exit Splash page which might contain a brief summary of your offer and a discounted order link. More sales = more profit... Without any extra cost to you! As an alternative to the above strategy, you could send them directly to the order link. This would mainly be useful if your primary sales objection was that your exiting traffic felt that your initial price was too high. Why not send them directly into the shopping cart at a price they can't refuse? If you're getting a high "bounce rate" on your site (visitors are quickly leaving), you might use the Exit Splash program to simply slow them down and send them back to the same sales page. Perhaps they are leaving your site before getting to the best part of the offer. Your pop-up can quickly tell them what they're missing out on, and give them the opportunity to return to the page for more information. You'll be making additional sales without even adding an additional offer. If your customers are very price sensitive, you could actually "stack" Exit Splash pages to show an even LOWER price if they try to leave the discounted offer on your first Exit Splash page. There is no limit to how many Exit Splash pages you use in conjunction with each other, but I recommend no more than two. It's been shown that a 2nd "downsell" will capture additional buyers... and that's an extra income stream that was previously untapped! As an alternative to the "Stacked" Exit Splash strategy mentioned above, you could use the 2nd Splash page for something entirely different. In other words, the first Exit Splash might offer them a discount, but if they decided to leave THAT page, you could hit them with a new Exit Splash to capture them onto your opt-in list, or send them to a DIFFERENT offer, etc. Instead of a discounted offer for your product, you could send your exiting visitors to a special "One Time Offer" on your Exit Splash page. One time offers (OTO's) have been proven to be a great way to add extra cash to your online business. It's also a great way to utilize Resale Rights or PLR material that you may have purchased. You'll be turning those previously wasted visitors into an extra income stream. Suppose you have multiple websites (it could be a few, or it could be hundreds). You could install separate targeted Exit Splash pages on each of them, OR you could simply set up ONE Exit Splash page and use it for all your sites. This could work especially well for something like an OTO like I just described above. 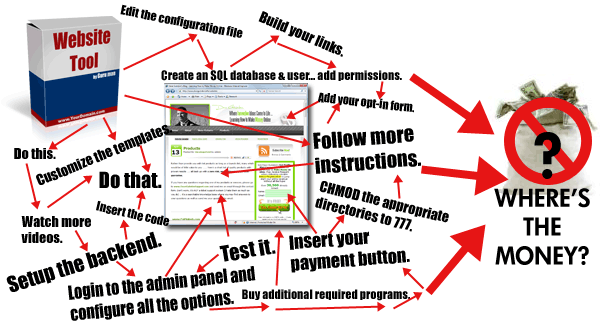 You could set up one great OTO, and use it as an extra income stream to monetize your exit traffic on all your sites. If you're selling a membership... you could use your Exit Splash page to offer a free or low-cost trial. Rather than seeing those visitors disappear forever, you might as well try to get them into your membership. Some of them will stick with it, and you'll be adding recurring profits with practically no extra work. A "free plus shipping" offer could work great for the above membership site strategy. By offering something for free, you can really get peoples' attention and get them to look at the offer on your Exit Splash. If you don't have an offer of your own, there are plenty of "free plus shipping" offers that you can promote as an affiliate and earn commissions for giving away memberships. Most of the major affiliate and CPA networks offer those kind of promotions. If you're using a long-copy sales letter, or a long video on your site, you can utilize your Exit Splash to provide a "reader's digest" version of it. Some people have the attention span of a housefly, and they simply won't buy from a long sales page (or opt into a long squeeze page). So you need to give them ALL your information in a few easy points that they can skim. You don't want to do that on your sales page, but you can do it on your Exit Splash page and make extra sales that would have been lost. If you're using a video sales letter, you can use your Exit Splash to give them the option of viewing a written version of your sales letter. Many video sales pages do not contain any written copy these days, because we want the visitor to be focused solely on the video. But that won't appeal to everyone, and not everyone will sit through a 30 minute video to find out the price of your product. This is a great way to capture THOSE people! On any type of site... you could use your Exit Splash page to capture leads to your opt-in list. A good tactic would be to offer a free gift or bonus of some kind as an incentive for opting in. If you can get them onto your list you can still make money from them by following up and selling your own products or affiliate offers... and that's traffic that would have simply gone down the drain! You can use your Exit Splash page to increase the opt-in rate of your squeeze page. Unless you're converting 100% of your visitors into subscribers, you're wasting traffic. By utilizing an Exit Splash page, you can capture a greater percentage of your visitors. You might offer an extra bonus in your Exit Splash. Or you might offer an alternative page: If your squeeze page is short, you could offer more details. If your squeeze page is long, you could offer an abbreviated version. The bottom line is you'll be getting MORE subscribers from your existing opt-in page, without any additional traffic! Another way to maximize your squeeze page would be to use the Exit Splash to bypass the opt-in process. There are some folks who just won't opt into anything, and that's OK, but you can still profit from those visitors. If they're going to leave your site anyway, why not give them the option to bypass the squeeze page and go directly to your sales page or other offer. You'll be putting more money in your pocket, without it costing you anything! 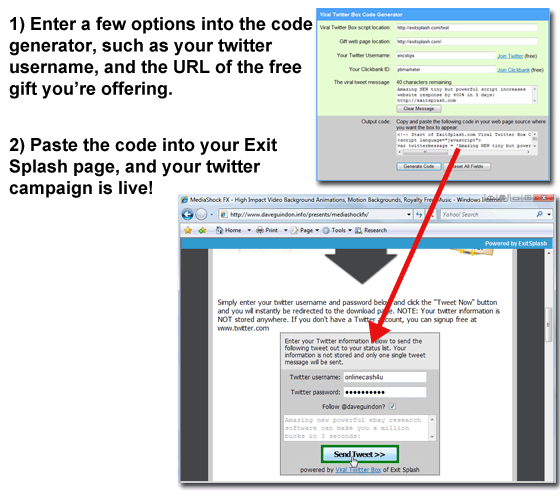 You could also use your Exit Splash to build your social networking lists. For example, you could give them a bonus to follow you on twitter, or point them to your facebook profile. For that matter, you could list ALL of your social networking options on your Exit Splash page, and give those visitors many options for connecting with you... which will lead to more sales in the long run! In the above strategy, you could even send them directly to your social networking profile if you wanted to. For example, the pop-up could say... "Hey...Have you seen my facebook page?" (or twitter, or whatever) And the visitor could click to go directly to that page and become your friend or follower. Again, you're opening up a new channel of communication with them. Maybe your sales page didn't connect with them, but if they become your friend you can market something else to them in the future... thus the visitor is not wasted. You can even use an Exit Splash page on your blog. You probably wouldn't want to put it on your entire blog, because your repeat visitors would get tired of it. But there's no reason why you couldn't use it on an individual blog post, resource page, or product review. You can even paste the code directly into a blog post. For example, suppose you're doing a product review. When visitors leave that page, you could give them an Exit Splash with the option to go directly to that product (via your affiliate link of course!). The Exit Splash tool is perfect for AdSense sites, or other contextual advertising sites which rely on SEO or other free traffic sources. Think about it... what's the goal of your AdSense site? You want people to come to your site (most likely via search engine results) and you want them to click on an ad. But what if they decide to leave your site without clicking on an ad? That search engine visitor was wasted. By using an Exit Splash page, you can capture those visitors to an opt-in list, or send them to an offer related to your niche. Once again, you're turning wasted traffic into cash! And in case you hadn't thought of it yet, Exit Splash pages are a great companion for PPC marketing. More than any other form of traffic, it's easy to see the COST of each visitor when you're using PPC. So it's painful to see those visitors go to waste. By implementing Exit Splash on your landing pages, you can maximize your profits and get more value out of each click. If you're doing any affiliate arbitrage (aka "click flipping" or the google cash method), then there are a couple ways you can increase your ROI by using Exit Splash pages. One strategy is to send your traffic to a squeeze page rather than a pre-sell landing page. That way you can build your own list, and follow up with those visitors. The problem is that you also have a higher bounce rate, with fewer of those clicks actually seeing an offer. 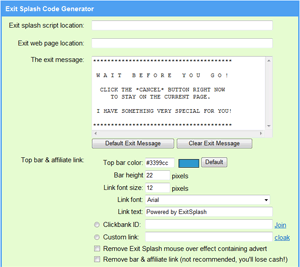 By using Exit Splash, you can capture those exiting visitors and give them the option to bypass the squeeze page. The Exit Splash can send them DIRECTLY to the sales page (via your affiliate link), so you can still have a chance of making commission from those otherwise "wasted" clicks. On the flipside of the above strategy, you might be sending clicks to a pre-sell landing page, or to a landing page with an embedded CPA offer. This of course gives you a better chance of making sales than if you were sending them to a squeeze page, but you're not building a list. But by implementing Exit Splash on your landing page, you can capture the exiting traffic and pull them into an opt-in list. That way you can follow up with those prospects and continue to promote the same offer, and/or additional offers to them. You can also use your Exit Splash page to find out WHY visitors are leaving your site. It's so simple, yet this information is like solid gold to marketers like you and me. All you have to do is set up a one question survey (or more if you prefer), and you can find out EXACTLY what you need to do to optimize your sales process and improve your website. As you've seen, there are MANY ways that you will gain more revenue, and more subscribers by implementing the Exit Splash program into your business. I'm including my favorite copy-and-paste tools for you to instantly maximize and monetize your Exit Splash pages! As you've seen from the huge list above, the sky's the limit when it comes to finding ways to profit from your Exit Splash pages. In case you hadn't noticed, Twitter is one of the hottest social networking sites ever to hit the web. It's also become a hotbed for marketers to build profitable lists of followers, and to virally spread links for their products. This is the same tactic that I used to gain over 1,700 twitter followers in three days, and make many sales of one of my products. You offer someone a "free gift" in exchange for Re-tweeting a message about your product on Twitter. They click the tool to Re-tweet the message, and they also have the option to become your follower. After the tweet, they are directed to the download page for their gift (you could give a downloadable report, or some PLR stuff, or whatever). This is a great tool to use on your Exit Splash page to find out exactly why visitors are leaving your website. People enjoy giving their opinions, so when your pop-up gives them the opportunity to stay for a moment and give their opinion, many visitors will oblige. Even if only a small percentage of your exiting visitors explain why they are leaving, it will give you a good overall picture of what needs to be improved. For every person who gives their opinion, you can be sure that there were many more who felt the same way. If you're serious about MAXIMIZING your conversion rate, this is one of the most powerful tools you will ever use. This is so powerful that it can actually MULTIPLY your conversion rate. A particular online marketer that I know used his exit page to capture the comments of his exiting visitors to find out why they were leaving the site. He discovered that many of the visitors were under the impression that the techniques being sold on his site were illegal (even though they were perfectly legal). He would have had NO IDEA about this unless he had polled his exit traffic. As a result, he made a small change to his site regarding the legality of his product, and his conversion rate SKYROCKETED! The responses from the suggestion box can be sent directly to your email, so you can keep a pulse on the feedback from your site. You may optionally enable the customer to provide their email address, in which case you could also follow up with them to handle their concerns, which may result in more sales. When a visitor submits the form, you can redirect them to ANY link of your choice. That means you could send them to another offer they may be interested in, or to a squeeze page, or to your twitter page for example. I'm really excited about this built-in tool, because it enables you to add yet ANOTHER income stream to your Exit Splash pages. If you choose to use this option, it will generate an "ad bar" across the top of your entire Exit Splash page. You could use the default mode, which means you will earn commissions for referring visitors to this software. OR you could put in a custom link of your own. It could be a link to one of your sites, or even an affiliate link. Bottom line: There are MANY WAYS to make money using the Exit Splash program, and I've done everything I can to make it as easy and profitable as possible. I'm ALSO including a collection of IMPACT BONUSES to make your Exit Splash pages deadly effective! In case you hadn't noticed, I REALLY want you to succeed with this. So I decided to include 3 basic Exit Splash page templates as well as some fancier ones. I'm not going to talk much about them, because templates are templates, right? They're time savers. All you have to do is plug in your own details, upload them, and they're good to go. These templates are designed to be used with the extra scripts that I'm including, or you can put anything else on them. Plug and play baby. Can you say... No brainer? As you've seen throughout this page, one of the major uses of Exit Splash pages is building an opt-in list. And I'm not going to preach to you about list building, because I'm sure you're aware that your list is one of your greatest assets as a marketer. But I want to make sure you know exactly how to put your opt-in form on your Exit Splash page, so you can build your list even faster! This video shows you precisely how to do it. Offering a discount is obviously a powerful way to utilize Exit Splash pages to make more sales of a product or service. I recorded a video showing you EXACTLY HOW to put a discount on your Exit Splash page. I'll show exactly how to setup a discount link on Paypal and ClickBank, and you can use this technique with any payment processor. In addition to the video in the impact bonus #3 on how to insert a paypal dicount button in your exit pages ... I decided to hand pick several high converting order button images. Make sense right? Why not use an order button that makes you more sales?! I have included some very nice hand-picked graphics you can quickly insert into your exit pages to increase the response of your exit pages! Plus, you can use these images in any website, webpage, or blog ... it's up to you. This is similar to the Suggest Box concept, but it takes it a bit further and shows you how to conduct a more in-depth poll of your exit traffic. Rather than just an open-ended question with a box for them to type their answer, you could ask specific questions with multiple choice answers, and get a flood of valuable data to optimize your website. This video will show you how to set up a poll on your Exit Splash page using a FREE service. I also show you how to combine a poll with the suggest box in your exit page! In case you missed it earlier on this page, the Exit Splash program has an audio feature built into it, so you may choose to play an audio message when the splash pop-up appears. These videos show you how to get the maximum impact with audio, and also show you how to edit your own audio using FREE software. It also shows how to INTEGRATE audio with various Exit Splash strategies such as offering a discount or soliciting suggestions. As you know, the Exit Splash program will help you convert your web traffic and make the most of it. But think about how much money you could make if you were getting a LOT more traffic to begin with! That's exactly what these videos will show you. They'll teach you the secrets of getting a steady stream of targeted traffic to your site. You can also resell this video collection and keep 100% of the profits, so there's another potential income stream for you! With some basic HTML skills you can really take your Exit Splash pages to the next level and customize them to your heart's desire. These videos are designed to teach a brand new newbie enough HTML to do the things that will really help you in your business. This video collection includes Basic Resale Rights, which means you can resell it, and you can even re-brand it with your own name and turn it into a new product! These bonuses are worth $400.00 if I were to sell them separately! AND I'm backing it up with my dedicated support! As I mentioned near the top of this page, I've spent a lot of time in school. In fact, I've spent most of my life in school, right up until last year when I got my Master's degree in Engineering. I believe that my university experience has played a role in how I like to provide training materials to support my products. And it's probably not for the reasons you would think. It actually stems from some very frustrating experiences that I've had in the past with university professors. Some of them expect you to know certain things, and yet they fail to provide any direction or materials on HOW you're supposed to learn it, or what you're supposed to do. So when I provide training materials, I like to lay everything out and explain things in the most STEP BY STEP way that you can truly follow and use. I also want you to know that you will have support available if you need it. You'll have 24/7 access to my helpdesk, and you will also receive the personal email address of my dedicated customer support manager! Customer support is important to me. We're here for ya! Here's the part you've been waiting for! Before I tell you the price, I think we better do a quick review of everything that you're getting. That's over $750.00 of REAL VALUE. And that's NOT just some imaginary number. I could easily sell this Exit Splash package for somewhere in the $497.00 - $997.00 range, and people would certainly buy it. After all, everyone who tested this program made at least $500.00 and/or added a ton of subscribers to their list in a very short period of time! But I'd like to get a lot of people using this program, and get you making money with it right away. I don't want to limit it to just the "elite marketers" who can afford it. When I released my Virtual Smart Agent product last year, I took the market by storm and basically dominated my competition by offering a superior product. This time around, I don't really have any competition for Exit Splash. This is the first program to include the features that I'm including. So I'd simply like to set the bar high and get a lot of people using it ASAP. I've worked VERY hard on this program over the last year, and now I'm ready to see it helping people like you. That's the greatest payoff for me. Only $497.00 $197.00 $67 $47 Today! Oh... and that's a ONE TIME fee, with no more payments! And you're getting an UNLIMITED license to use it on ALL of your websites. But I'm Also Going to Make It 100% Risk Free! How long will it take for you to make back your $47 investment? For most marketers, I'm guessing it will be merely a matter of hours. As soon as you implement it on your website, you will start seeing instant results. Remember, there are revenue streams hiding on your website that you're probably not tapping into. How many extra sales would it take for you to earn an extra $47? Obviously it depends on what you're selling, but even if you're selling a low-priced product, it won't take more than couple sales. And how many extra subscribers can you gain by implementing Exit Splash as a lead capture strategy? Is it worth a one-time payment of $47 to capture fresh leads for your business EVERY DAY? Are you ready to start turning your "exit traffic" into cash? If you're serious about your business (and I know you are), the answer is "yes". It's worth it... and then some. I guarantee it! So go ahead and grab your copy of Exit Splash now. Don't Have to be a Technical Wiz ... By Using Exit Splash I able to Generate about 45 Subscribers to my Opt-in List!" and a LOT of sales and subscribers to gain! Special Partner Discount by Invitation ONLY! Mark my words: I WILL be raising the price by AT LEAST 42%. Probably even more than that. Yes, I want to grab this very limited offer! Yes, I want to make more sales and/or get more subscribers without any additional traffic required using the Exit Splash script! Yes, I want the Viral Twitter Box and Suggest Box scripts to explode my website response to new levels! Yes, I want all 8 FREE impact bonuses designed specifically to positively impact my new exit technology! Yes, I want access to the 3 code generators and the quick-start videos to help me get started within the next 5 minutes from now! Yes, I understand that I'm allowed to use my new scripts on UNLIMITED sites/pages! Yes, I want to receive FREE updates to each script for LIFE! REMEMBER - This is a Special Partner Discount by Invitation ONLY ... and this discount will end VERY soon! specializing in digitally delivered products. Risk Free for 2 FULL Months! Try it risk free today! I believe in this program so much that I'm giving you the complete system and all the bonuses at my risk, not yours! I'm willing to do this because I believe it will truly help your business. If you're not satisfied with the program, just let me know anytime after your purchase and I'll refund 100% of your purchase. "I Made $1,242 from Two Products in 7 Days Resulting in $5,322 Extra per Month using Exit Splash!" "In Less Than a Week We Had 43 More Sales We Normaly Wouldn't Have Got ... and That Amounted to Over an Additional $2000 in Cash!" Todd is a well-known meteorologist who has been forecasting New England's weather for over 25 years, and has become a prolific Internet marketer in recent years. He decided to give my script a try, and in ONE DAY he has already made an extra 12 sales and made an extra $588.00! Do you want to stop wasting a large percentage of your web traffic? Do you want to make more sales and get more subscribers... without any additional costs, and without any additional traffic to your site? I encourage you to take action today and grab my Exit Splash package while it's available. You'll be glad you did. "Try and Fail ... But NEVER Fail to Try!" PPPS: Fair WARNING: I'm currently running a special discount and it will end soon ... if you come back to this website and the special discount price is gone, sorry you missed out! Grab your copy now before we raise the price.